The story follows a multitude of characters, and it is difficult to say who our protagonist is. The most common bond between the many characters is Arthur, a film actor whom we meet in the middle of a stint as Macbeth after a long and illustrious career in Hollywood. Through Arthur, we meet Miranda and Elizabeth (two of his three ex wives), a paparazzo who frequently paid his bills with photographs of Arthur (Jeevan), a young girl who was in the play with Arthur as a child (Kirsten), and Arthur’s best friend (Clark). The synopsis of this novel could be considered very misleading, as it mentions a post apocalyptic society ravaged by disease, which paints a very specific and all too common picture in modern literature and film. However, the synopsis does not reveal the true message behind the novel, at least as I interpreted it. Mandel chooses to kill off 99% of the population, as well as modern technology, to reveal the driving force behind the lives we all lead. For Mandel, this is art. This message is highlighted by the quote that the Traveling Symphony have chosen as their slogan “Survival is insufficient.” Many of the characters in this novel find peace of mind and purpose in their art, and it is this common bond that connects the many different perspectives that we encounter in this novel. Miranda, Arthur’s first wife, escapes her seemingly restless life by devoting herself to the comic book that she has worked on for the majority of her adult life. The members of the Traveling Symphony have decided to dedicate their lives to entertaining the few people left on earth with Shakespeare and music. As someone who considers the arts to be such an integral part of a fulfilling life, this underlying message resonated with me deeply. I often find myself questioning the importance of certain outlets of art, being that I work in the entertainment industry, and this novel allowed me to remember the importance of these mediums. 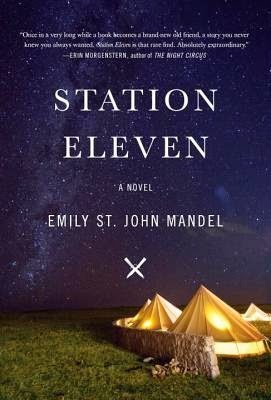 An aspect of Mandel’s writing that I particularly enjoyed was her ability to drop us into a new setting with a new character and allow us to discover the significance of each point of view without spelling it out in an obvious manner. Although this novel may seem like it would be thrilling, due to its dramatic premise, I found that I couldn’t put the book down instead because I wanted to understand the many connections between all of the characters in the story, and I reveled in the intertwining of their lives. It was fascinating to see how a small event in one characters life could essentially shape another characters entire existence. Bringing this to my attention made me think that Mandel’s purpose, in addition to commenting on the arts, was to highlight the strengths and weaknesses of the human condition. The use of the comic book excerpts (written by Miranda over the course of her life) was a bit puzzling to me, although I did understand the parallels between the plot of the comic and the events in the story. I think the overall connection between the two has more significance than I was able to extract, but I do not find that to be a fault of this novel. I admit, as someone who does not often seek out sci-fi material, I did glaze over the brief excerpts, and so I have no one to blame but myself for this gap in my understanding. The sheer existence of the comics, rather than their message, provided a majority of the connections between the characters, and that was enough for me. An interesting aspect of this story is the overall minimization of the gritty details in a world ravaged by disease. Rarely did a character focus on their hunger or fear for too long, as there was always something more abstract for them to contemplate, which seems entirely unrealistic but provided a unique take on this very common theme. Using this setting, made up almost entirely of silence, solitude and introspective thinking, Mandel chose to highlight the nostalgic nature of humans, in good times and in the darkest of times. Overall, I would summarize this book by saying that is it extremely thought provoking. It’s impossible not to think about how you think you would react if you were one of the characters in the story, and it should spark some very interesting discussions between those who have read the novel. I am anxious to find others who read it so I can pick their brains about what they took from the story. I also think that a second reading of this book could be extremely beneficial, and the story lends itself to that idea.